Information: St. Paul's bay has always been a summer resort, and with the increase of summer residents at the beginning of the present century St. Paul's Sanctuary became too small. 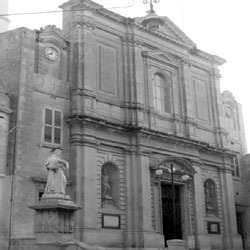 The Countess Anna Bugeja,in remembrance of the 1900 Holy Year, built a church dedicated to the Sorrows of Our Lady and gave it to the Franciscan Conventuals. The church became a parish in '1905 and was cosiderably enlarged in 1960-1979. Name: Parish Church of Our Lady of Sorrows Dedication date: 8 ta' April 1979. Priest: Parish Priest Rev Joseph Cilia O.F.M.Conv.